My Favourite Cuisine – I love to try out different cuisines ‘cos they are each different in their own rights but it must be vegetarian. My Favourite Book/Novel – I love thrillers and mystery novels. Just can’t put them down!!!! My favourite Place – Any place that gives me happiness and peace, most of all being with the people I love. PJ of Seduce Your Tastebuds says No folks, I’m not being selfish…I love to cook for anyone who loves good food. 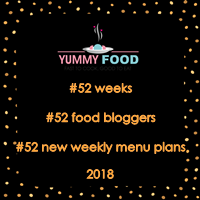 But I thought of what I would cook for myself after seeing Lubna’s announcement – Rendezvous With Kitchen Flavours a Scrummy Sunday Showcase, I listed out a few of them. Like she said, we all love cooking favorites for our families but never think of preparing something ‘special’ for ourselves. So, here are five of my favorite food stuffs that I can indulge upon anytime!!! 1. HAPPALA KARADHA PAAYASA – A sweet dessert from my hometown. 2. 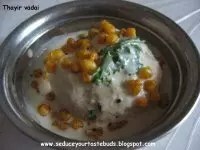 THAYIR VADAI – Fried lentil dumpling in yoghurt. 3. 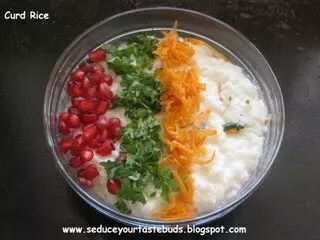 CURD RICE – Yoghurt n rice garnished with goodies. 4. 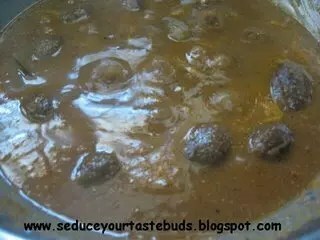 BABY BRINJAL IN TANGY SAUCE – A low fat version of traditional ‘Ennai Kathirikkai’. 5. 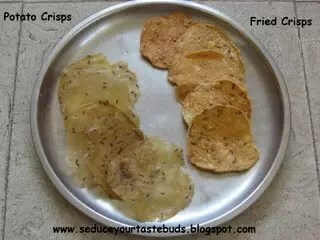 POTATO CRISPS – Crisp potato wafers,who would’nt love them!!! 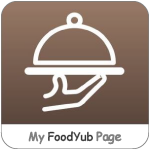 Clicking on the links mentioned above you can view the recipes in detail. 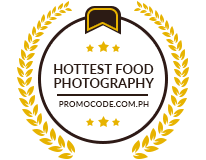 From some authentic to simple to global recipes, Seduce Your Tastebuds by PJ is the destination. You can send your entries here, Rendezvous With Kitchen Flavours. All the dishes r delicious, mouthwatering.. Interesting post ..loved your other posts as well..missed them but read them all now. ooh..so many tempting entries…good yaar.. Pleasure is mine dear PJ. Thanks a ton for participating in the event. Thank you Srikars Kitchen, Ramya, Priya, Anamika and G.Pavani.